I attempt to keep my mind open to trying new types of tea, especially teas I haven't enjoyed in the past. It can be a struggle to keep the mind open to change, but it can lead to wonderful things. 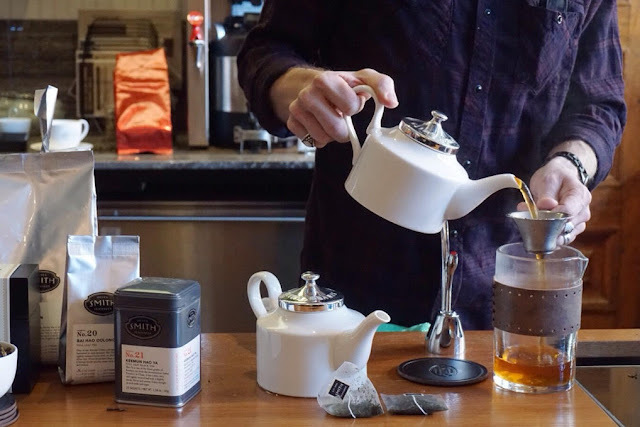 A few weeks ago I had the opportunity to taste Smith Teamaker teas and Stumptown coffee. 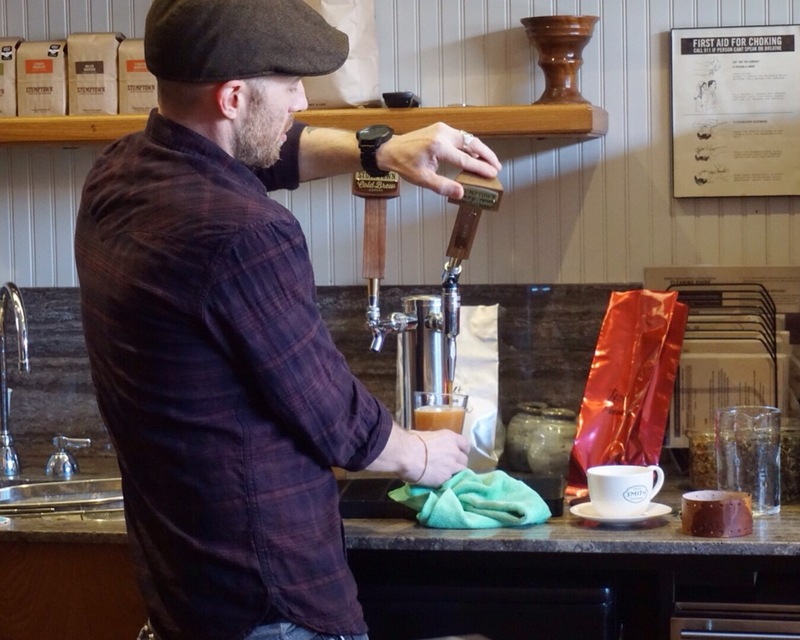 The two Portland, OR based companies collaborated on a special event in one of Stumptown's NYC locations. 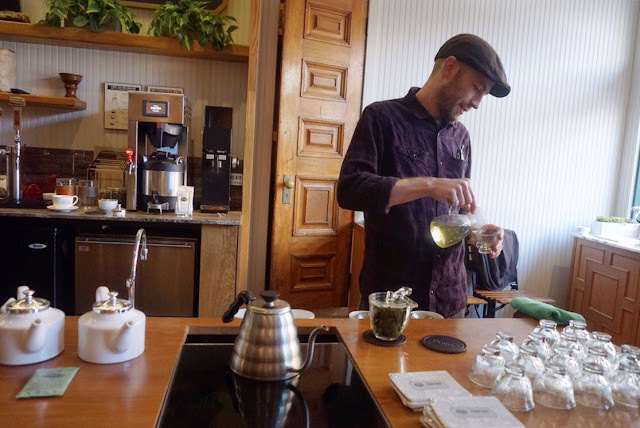 Smith Teamaker featured 'barrel-scented' holiday blends at this event. The idea of 'barrel scented' tea blends intrigued me, but I also hesitated. I'm not usually a fan of blends, especially those with strong flavors that mask the actual tea. But I was curious to learn more about Smith Teamaker and knew I had to go. Smith Teamaker was founded in 2009 by the legendary Steven Smith. He was a pioneer in the US tea market. He had a head for business and a passion tea. He sadly died after a battle with liver cancer earlier this year. The New York Times has an informative article about his tea journey here. 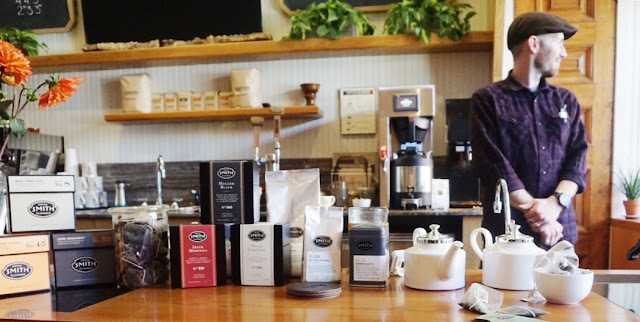 At Smith Teamaker everything is done in-house, including the blending and packaging. They create blends with unique combinations. I've heard positive things about the blends, but before this tasting I had only tried their pure teas, which I've enjoyed. 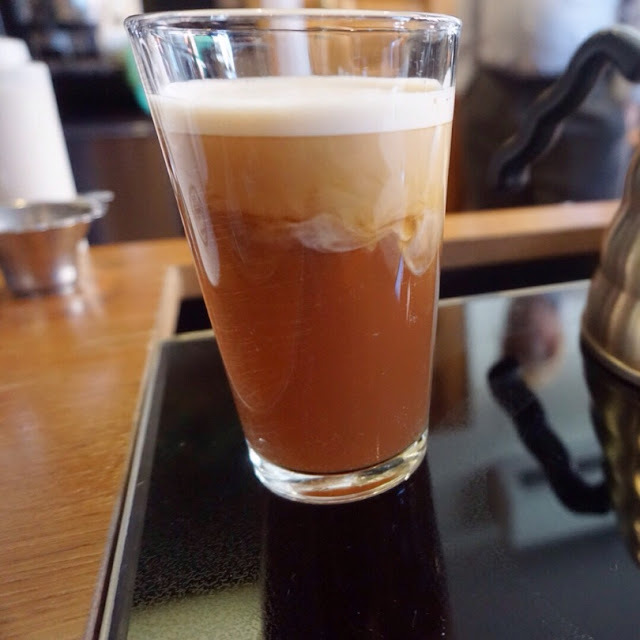 Walking down a quiet West Village street you can't miss Stumptown Coffee Roasters. The bold signage and huge windows tug at your curiosity. The aroma of freshly roasted coffee grabs your nose and pulls you towards the door. Even though I'm mostly a tea drinker, I do enjoy a well made coffee now and again. When I walked in to Stumptown's tasting room I was greeted with a cup of floral, citrusy Ali Shan oolong. While sipping its buttery smoothness, I was thrilled to see fellow blogger Rachel whom I hadn't seen in awhile. We shared a cheerful moment while sipping our tea. I was then introduced to Tony Tellin, who has stepped into Steven Smith's shoes as head tea maker for the company. Tony worked by Steven Snith's side for 19 years before his passing. I love that when Tony started he had no formal tea experience, but grabbed everyone's attention with his amazing palate. Tellin guided us through a tasting of various teas with a focus on the new holiday blends Smith is about to release. We started with Smith's Mao Feng Shui green tea. A well balanced, delicate sip. The tea sachets contain full leaf tea and are made from bio degradable cornstarch. If you must have teabags, this is a better alternative to the plastic ones. The cornstarch sachets don't impart unwanted flavors into the tea as most other materials do. We then moved on to the Lord Bergamot black tea, which is Smith's version of Earl Grey. I usually dislike Earl Grey because it has a soapy flavor and texture. It has always reminded me of sipping on a grandmotherly perfume. This tea took me by surprise with its smooth citrusy flavor. The tea is a bold Assam second flush that is well blended with Italian bergamot. After these introductory teas we went on to the holiday themed blends. The first was White Chrysmas. This is a white tea aged in a white rum barrel for over 2 months. I had no idea what to expect when Tony described the aging process. Yunnan white tea and chrysanthemum flowers are scented with pears that were re-hydrated in brandy. This tea is quite aromatic. Floral, peppery, with a pleasing softness. It has a definite hint of brandy as well. I enjoyed this much more than I was expecting to. It has a nice festive flavor. The second holiday tea was the Mulled Black. As the name suggests, this tea has mulled, spicy holiday flavors. This is a golden buds Yunnan black tea aged in an aquavit barrel with added roasted hazelnuts, cloves, cranberries, cinnamon and toasted coconut. I'm not very familiar with the flavor of aquavit, I've only had it once or twice and not recently (and I think it can be flavored). But everything mixed together gives a rich, comforting feeling. After a sip I imagined sitting by a cozy fire wrapped in a warm blanket with a cat happily purring my your lap. I would definitely purchase this tea to sip on quiet snowy nights. The final holiday tea we tasted was a tisane- Irish Moringa. Moringa is an herb grown in India that is supposedly high in antioxidants and minerals. The herb has an interesting flavor, a bizarre mix of licorice and cocoa. This herb was aged in a whiskey barrel. The tea has flavors of vanilla, licorice, cocoa, orange, and whiskey. I was hesitant to try it because I dislike licorice, but the brew was smooth and pleasing. Masala Chai coming out of the tap! After this tea tasting we were treated to a few Stumptown brews. After the coffee we had a unique tea treat- Masala Chai Nitro, You could say it is Masala Chai on tap. Not just on tap however, but on 'nitro'. Nitrous Oxide was added to the keg of Masala Chai which gave it a super cold, foamy texture. From what I've gathered, this is a technique that gives beer a smoother, creamy texture. Why not for tea? I enjoyed the unique texture of this 'brew'. They created a 'dirty' chai that had Stumptown coffee added along with bourbon vanilla, and chocolate malted barley- flavors inspired by the chicory infused coffee found in New Orleans. This was an exciting taste experience. It was an enjoyable morning of tasting tea and meeting friendly folks from Smith Tea and Stumptown. If Smith had a shop in NYC I know I'd be a regular. I'd be back not only to enjoy some of their blends, but to have that super foamy Masala Chai. We received a parting gift of Smith's Georgian Caravan tea along with a jar of huckleberry jam. It is a Russian tradition to sweeten tea with a spoonful of jam, and I have reserved this special package for my Office Tea Club. Stay tuned for a post all about it! Thank you to Smith Tea and Watershed Communications for inviting me to this event. It has helped to keep my mind open to trying new flavor combinations. Can't believe I didn't see this post. Tony is a really cool guy. And their nitro chai is pure JEENYUS! just tripped over this blog while looking for something else, What a nice surprise!